Istanbul has no rival anywhere. It spells adventure. It has the ingredients that unite to create glamour, excitement and mystery. Centuries of invaders have been intrigued with this magic and majestic city with its 340 Byzantine columns, 500 mosques, fabulous palaces, fountains, cisterns, baths, churches, wells and covered bazaars. NO city on earth has so many old buildings of beauty and distinction. Istanbul is no myth. Its reality lies in its extraordinary history that goes back through countless phases to the first colonisation in 657 BC by the Megarians who named it Byzantium after their commander Byzas. The Roman Emperor Constantine elevated Byzantium to the capital of the Eastern Roman Empire in the third century AD and renamed it Constantinople after himself. The Turks finally brought the Eastern Empire to an end when they burst through the city walls in 1453 and established Constantinople as capital of the Ottoman Empire. Istanbul is a bridge between Europe and Asia, the Black Sea and the Mediterranean, a position that endows it with one of the most unique and beautiful settings in the world. For, between the hills on the European and Asiatic shores flows the Bosphorus, the brightest gem in the diadem of nature. "This beautiful strait, sometimes spelled Bosporus and sometimes Bosphorus, was so called from the earliest ages by the ancients; from the mythology of 10, the mistress of Jupiter, having passed over it in the shape of a cow. It resembles the Dardanelles, in length, breadth and current, and like it, is a narrow separation which divides Europe from Asia; but it has many features familiar to itself. Instead of being a solitary stream running between deserted shores, it is a body of water full of life and animation, winding its way through banks covered with palaces and villages, shaded with magnificent forest trees, presenting to the eye, at every mile, a new scene of crowded existence." The Turks have named this natural channel, dividing the continents of Europe and Asia, while joining the Black Sea to the Mediterranean by way of the Sea of Marmara and the Straits of Dardanelles, BOGAZICI, which means "the inner strait." Its clear calm sky, its glittering sea, its amphitheatre of thickly-peopled hills, its geographical position, its political importance and above all, its surprising novelty, tend to make everyday in that gorgeous scene, and under that sunny sky, a season of intense enjoyment. The minaretted city cresting the opposite side of Tepebasi like a diadem, stretches along in all the splendour of its mosques and palaces; terminated in one direction by the Topkapi Sarayi glittering among its cybresses and plane trees, and enclosed within the picturesque walls which ate washed by the blue waves of the Bosphorus. In the distance the bright sea of Marmara dances in the light, bearing a thousand gleaming sails upon its bosom, and its scattered islands heave up their fantastic outline like marine monsters, while Üsküdar (Scutarl) closes in upon the eye, sweeping gracefully along the edge of the Sea of Marmara, until it grows into majesty as it nears the Bosphorus and flings over the waves of the "oceanstream", the stately shadow of Büyük Camlica. "The seaward approach to Istanbul can be a rare experience of pleasure. The first impression is of domes and minarets beyond count, semi-circles and vertical tangents, with three huge buildings dominating a unique and romantic skyline: Santa Sophia, and the Mosques of Sultan Ahmet and of Süleyman. These are surely among the greatest achievements of man in the art of building. Their architects have raised thousands of tons of stone into the air and enfolded vast volumes of space with an ease and grace which are astonishing." Along a line drawn, starting from a point between Sarayburnu (Seraglio Point) and KIZ Kulesi (Leander's Tower) to a point between the Rumeli and Anadolu Fenerleri (Lighthouses), the length of the Bosphorus is 29.9 kilometres .If you take the Ahirkapi Lighthouse at the southern entrance as the starting point, then the distance of the Bosphorus to the northern entrance is 32.2 kilometres. The total length of the European shore reaches 46 kilometres when all inlets and promontories are taken into consideration, including the Golden Horn; while the Asiatic shore between the Anadolu Feneri (Anatolian Lighthouse) and KIZ Kulesi (Leander's Tower) is 34 Kilometres long. Its depth varies from 120 to 480 feet in midstream. A rapid current flows from the Black Sea to the Sea of Marmara but a counter-current below the surface carries saline water upstream. However, scientists agree that the undercurrent carrying the saline waters of the Mediterranean is pushed back by a turbulence since the northern entrance has a graded submarine terrace. Consequently, the undercurrent surfaces and mixing with the rapid flow returns to the Sea of Marmara unable to enter the Black Sea. "These counter-currents form eddies adding colur and music to the glorious shores of the Bosphorus. The colour of the soil varies between black and red and the hills are covered with pines, firs, walnuts, horse-chestnuts, mulberry, medlar, lime-trees, pomegranates, fig, bay and magnolia trees. 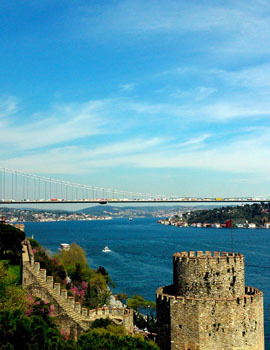 However, the smiling shores of the Bosphorus turn reddish purple in spring with the blossoming of Judas trees. Near the entrance to the Black Sea, the volcanic rocks in greenish or scarlet brownish colour were formed at the end of the sacond Geological Division, but we know that the Black Sea took its present form in the PLIOCENE era. The rocks and fossils found on the remaining sectors of the Bosphorus reveal that the history of the Bosphorus stretches as far back as the DEVONIAN and SILURIAN eras, going back 435 million years. The Bosphorus narrows between Emirgan and Kannlica to 790 metres and between Arnavutköy and Vaniköy to 875 metres. After these points the parallel between the shores disappears. The narrowest point on the Bosphorus is between Rumelihisar on the European shore and the Meşruta Yali on the Asiatic shore where the width only 698 metres. At the entrance to the Black Sea, the Bosphorus widens and the distance between the European and Asiatic Lighthouses reaches 4.5 kilometres (3 miles). Between Yeniköy and Cubuklu it is 1480 metres, and at the entrance to the Sea of Marmara, between Semsi Pasa at Üsküdar and Salipazari on the European shore, it reaches 1675 metres. The broadest part of the Bosphorus is between Büyükdere and a distance of 3.3 kilometres (2 miles). The slopes of the Bosphorus range between 15 and 200 metres high. The highest point on the European shore, where at Kocatas Spring water gushes from its source; is 235 metres; on the Asiatic shore the Yusa Dag (the Giant's Mountain) is 197 metres high. Again, on the Asiatic shore, the Kucuk Camlica is 229 metres and the Büyük Camhca is 262 metres; Göztepe lying between Kanlica and Cubuklu is 280 metres high. Bosphorus derives its name from Greek mythology. 10, daughter of Inachus, first King of Argos, beloved of Zeus and metamorphosed through fear of Hera, his wife, into a heifer, crossed the Bosphorus in her wanderings, thereby giving the name of Bosphorus to the strait dividing Europe and Asia. For the defence of Istanbul, the Byzantine Emperors constructed fortifications on the Bosphorus. Later one of the Ottoman Sultans, namely BAYAZIT, the thunderbolt, had the Anadoluhisan fortress built in 1393 and named it GÜZELCEHiSAR. Mehmet, the Conqueror had the Rumelihisar Castle constructed in ninety days in 1452. After the conquest of Istanbul, the Bosphorus together with the Sea of Marmara and the Black Sea became Turkish inner seas and in the second half of the sixteenth century the Mediterranean was considered a Turkish lake. However, towards the middle of the eighteenth century, during the decline of the Ottoman Empire and with the ascendancy of Russia as a world power, the Bosphorus gained a well deserved importance in international politics. The Hünkår iskelesi Treaty of 1833 opened the Bosphorus to the Russians and closed it to every other European power. With the growing influence of the European Powers, especially after the Crimean War, rules were codified in treaties of 1841 and 1871 governing the transit of commercial and naval vessels through the Bosphorus and the Dardanelles. After the Ottoman defeat in World War I, an international commission assumed control of the straits. However, after the declaration of the Turkish Republic, Turkey resumed full control of the straits in 1936 with the signing of the Montreux Convention. "After a spate o one-sided abrogation of treaties - Hitler's Rhineland coup had just occurred - the admirably constitutional approach of the Turks disposed the Powers in their favour, for, instead of marching into the demilitarized zone, the Turks preferred to see the new status of the Straits worked out at an international conference at Montreux, where together with the right to remilitarize her own territory, Turkey secured a revision of the clauses governing the passage of ships through the Straits - this narrow strip of water which, though it looks at each outlet like the Thames at London, is in fact an arm of the sea. Tradition demands that the ships of the Powers should use it as freely as the high seas, but the unusual nature of this particular strip of the high seas makes some modification necessary in the interests of Turkey. The Montreux Convention permitted unrestricted use of the Straits to the warships and merchantmen of the Black Sea Powers and to the merchant ships of any Power in time of peace. During war Black Sea warships still enjoyed unrestricted passage, provided they were helping a victim of aggression under the Covenant of the League. In a war in which Turkey was herself a belligerent, full control of the Straits passed to her." The Bosphorus has an inlet, a natural harbour which is an arm of the Sea of Marmara, called the Golden Horn. It is a deep drowned valle about 7 km long. Two streams, Ali Bey and Kagithane, flow into the Golden Horn which was so named as the early inhabitants saw it as shaped like the horns of a stag or water buffalo. Turks call it the Halic, i.e. the Gulf. The Bosphorus itself has two pleasant rivulets on its Asiatic shore, called Göksu and Kucuksu which empty themselves into the Bosphorus between the villages of Anadoluhisari and Kandilli. The two streams flowing into the Golden Horn were named by foreigners as the Sweet Waters of Europe, while Göksu and Kucuksu were known as the Sweet Waters of Asia. "The valley of Göksu, charmingly situated about midway of the Bosphorus and called by the Europeans the Asian Sweet Waters, owes its charm and its popularity to the circumstance of its being intersected by a pretty stream of fresh water, which, after flowing along under the shadows of tall and leafy trees, finally mingles its pigmy ripples with the swifter waves of the channel. The Anadoluhisan, or Castle of Asia, stands upon its margin, and painfully recalls the mind to the darker and sterner realities of life; or the visitor to Göksu might fancy himself in Arcadia, so lovely is the locality." Pondering on these words of Julia Pardoe, the traveller feels within him the first premonitory signs by which the heart recognizes the onset of a great love affair. After that first visit in spring, one will wander all day long in a delightful daze drinking in the light and enjoying the beauties of the Bosphorus. Each day will be a brilliant improvisation with full orchestra - the light on the sea, the folliage, the stabbing cypresses and the pink ana purple of Judas trees.